When your spacecraft doubles as emergency rations. During a lunch break in April 1963, Sidney Schwartz of Grumman Aircraft’s Human Factors System ran out to the supermarket. Normally, this would not be an unusual thing for a time-pressed engineer working on the Apollo lunar module. However, Schwartz was looking for something—and he wasn’t sure exactly what it was. What he needed was one new ingredient for a foodstuff he had conceived of for use on spaceflights. To the bewilderment of co-workers, Schwartz was developing a structural material that could double as emergency rations. He dubbed the product ESM, for Edible Structural Material. Surprisingly, the Grumman Advanced Development staff had taken an interest in the concept. Working in Grumman’s Plant 12 on the morning of that April day, Schwartz had made several trial batches using powdered milk, cornstarch, wheat flour, bran, and banana flakes, all baked in a press. The results were encouraging but not completely satisfactory. Strolling the aisles of the supermarket, Schwartz came upon something he thought would do the trick. Hominy grits was a cream-of-wheat-type cereal popular in the south, and here it was on a supermarket shelf in Bethpage, New York. The grits would add texture, just as gravel does in concrete. That afternoon he baked a new batch, using hominy in place of bran, and produced a workable, edible batch of ESM. Cost: $4.90. The foul-smelling brew was baked at 300 degrees under 3,000 pounds of pressure. The result was a dark brown crystalline structure that looked like (and some say tasted like) Masonite. Tests proved that it could be cut, machined, drilled, and threaded. It had a hardness factor of 87—Masonite’s is 80. Best of all, in the weight-critical lunar module, it weighed only .04 pound per cubic inch, and provided 350 calories per 100 grams. Grumman engineers thought ESM could be used for handles, instrument panels, lockers, clipboards, and partitions. 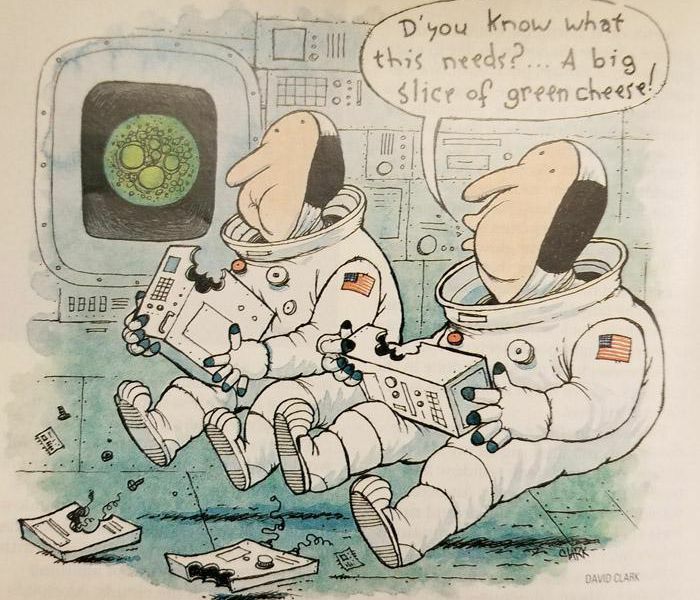 And desperate astronauts could soak it for several hours and end up with something that tasted vaguely like a breakfast cereal with a hint of banana. Shelf life, while not studied, was thought to be quite long, and protection against moisture could be provided by a strippable plastic film. Schwartz envisioned other applications for ESM, including tables and chairs, bunks, bookshelves, and partitions in lifeboats, small aircraft, and fallout shelters. Grumman decided to take out a patent. Searching for prior applications, attorneys could find only one patent for an edible structure: the ice cream cone. By May, the New York Times got hold of the story. Fully expecting to be the subject of industry jokes, the Grumman staff was surprised that there appeared to be great interest in ESM. Both the Air Force and the Army wanted to obtain all available information, as well as samples. The Canadian airline Nordair saw a use for ESM as an emergency supply for aircraft operating in the far north.